The climate change adverts banned today do not go far enough in their warnings of the dangers of inaction, the Green party leader has told Left Foot Forward. The climate change adverts banned today do not go far enough in their warnings of the dangers of inaction, the Green party leader has told Left Foot Forward. 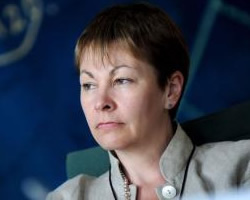 Caroline Lucas, MEP for South East England, described as “frustrating” the decision of the Advertising Standards Authority to ban the two nursery adverts, based on the children’s poems Jack and Jill and Rub-A-Dub-Dub. “What is needed is not just for the dangers to be highlighted but for a positive vision for the future to be presented, for us to say that ‘even if you don’t believe in climate change the measures you take will make your life better, will make your community better and in the long run will save you money’. You can see the problems with this bit, right? Imagine if someone said that about farming: “Producing all our food using trowels and back-breaking hard work is more labour-intensive than using tractors and combine harvesters, so we’ll increase employment if we stop using agricultural machinery.” Would that make sense? You’ll get higher overall employment with low energy costs, which isn’t helped by installing masses of expensive renewable energy capacity. Studies in Germany and Spain have found that these policies result in a net loss of jobs. Matt: Your point is seductive – but plain wrong. Check out http://viacampesina.org/en/ . Our madly resource-intensive agribusiness system cannot be sustained. In the long run, it is non-renewable resources that will be scarce, not labour. OF COURSE we should create far more jobs on the land. And Greens will. Presumably the complainers are worried people have been misled by the ads. So they would also presumably welome and announcement that the Government will re-run them with the ASA ruling taken account of – specifically the climate change “will cause more floods” changed to “are more than 90% likely to cause floods”. Ed Miliband should treble spending and run 3 times as many ads as before, just to clear up any confusion. And by the way, the problem with Matthew Sinclair’s argument is that the fact renewable generators do not need fuel buying for them (sun and wind still come free) is that more of the costs involved are spent on labout building and maintaining the things – which means the money is spent creating jobs, not buying a commodity. If he has evidence that fossil fuels are more labour intensive he could have linked to it. Rupert Read and Martyn seem to really have drunk the economic Kool Aid there. Don’t you understand the most basic point about jobs and labour? That they are a cost of scheme, not a benefit? Just try a little thought experiment here. We have this magic process which allows us to get all our energy through the labour of just one person for a year. We also have this other process which means that 2 million people must labour for that year to provide our energy. No, it’s OK, I know we don’t have that magic process. This is simply an attempt to explain the logic. Now, which system of energy provision makes us richer? The one using the labour of one person or the one using the labour of 2 million? Clearly and obviously using the labour of one person. For that means that the labour of the other 1,999,999 people can be used to do something else. Dig fields, search for the cure for cancer, wipe babies’ bottoms, sup a contemplative pint, chill out with the wife, whatever. As a result of using our magic process we’ve therefore got both the energy we desire and also dug fields, perhaps a cancer cure, clean babies and relaxed males and happy wives. We are richer as a result. From the labour of 2 million people we have more than if all two million were producing energy. Now, let us relax our assumption of a magic process. We need to use some amount of labour to produce the energy we need. We will be, other things being equal, richer the less labour we use to produce that energy. Yes, I know, other things are not equal. We might indeed want to substitute labour for fossil fuels. This is something we should try to work out. Are the costs of doing so less than the benefits of doing so? Good, now we have a process to work such things out. We can look at fossil fuels running out, we can look at climate change, we can try to look at all of the different costs and benefits. Then we sum them. And we get an answer. But, here’s the crucial point in that process. The labour we must use in each and any different variation of such schemes must be accounted as being a cost of such schemes, not a benefit of them. Hey, it might still be worth doing them, that’s what we’re trying to calculate. But while calculating we must make sure that we assign costs as costs, benefits as benefits. And insisting that more labour expended is a benefit is wrong: it’s a cost. For what we lose by assigning more labour is what that labour would have produced without working to produce energy. Economists know this idea as “opportunity cost”. And it always exists. It is the second of the only two things you really have to know about the subject (the first is that incentives matter). Now I realise that you don’t believe this for one moment but I’m an environmentalist too. I want us all to have a greener, cleaner world, one where we’re just as stinkingly rich and happy as we possibly can be within the constraints placed upon us by the real world (and that of course includes environmental limits). But you’re really not helping your (or our perhaps) cause by being strikingly ignorant about the very basics of economics. Jobs are a cost of a scheme. Therefore to claim that because a scheme provides more jobs it is better….this is simply wrong. You are claiming the equivalent of stating that Newton was wrong because apples actually fall up to the tree. Tim you miss the point. If the cost of fossil fuel energy is 100 pounds per unit, where labour costs are 10 pounds and 90 is the cost of extraction and processing excluding labour costs. If the costs of sustainable energy is 100 pounds per unit, where the labour costs are 60 pounds and 40 is all the other costs. I have no idea what the real figures actually are so this is just an example, but it demonstrates the possibility that for the same cost of providing energy you can have more or less jobs. Jobs are no more of a cost than any other cost. We could also do with less people creating complicated financial products which hide the real risk, just because workers doing something other than producing energy doesn’t mean that they will be doing something else that is beneficial to society. That is the point that is being made. Sure. So why is everyone saying that jobs are a benefit of a scheme? They’re not, they’re a cost. We wouldn’t say that a particular method of producing energy was a good idea if it meant higher costs of fuel. Or higher capital costs. Or higher land costs…..or higher any other cost. So why do we have people saying that a certain method of energy generation is a good idea because it has higher labour costs?